In shallow glass or plastic dish or resealable food-storage plastic bag, mix all marinade ingredients. Pierce beef with fork several times on both sides. Add beef and onions to marinade; turn to coat with marinade. Cover dish or seal bag; refrigerate, turning beef occasionally, at least 8 hours but no longer than 24 hours. Heat gas or charcoal grill. Remove beef and onions from marinade; reserve marinade. Place beef and onions on grill. Cover grill; cook over medium heat 15 to 20 minutes for medium doneness, brushing occasionally with marinade and turning once. Discard any remaining marinade. Cut beef across grain into thin slices. 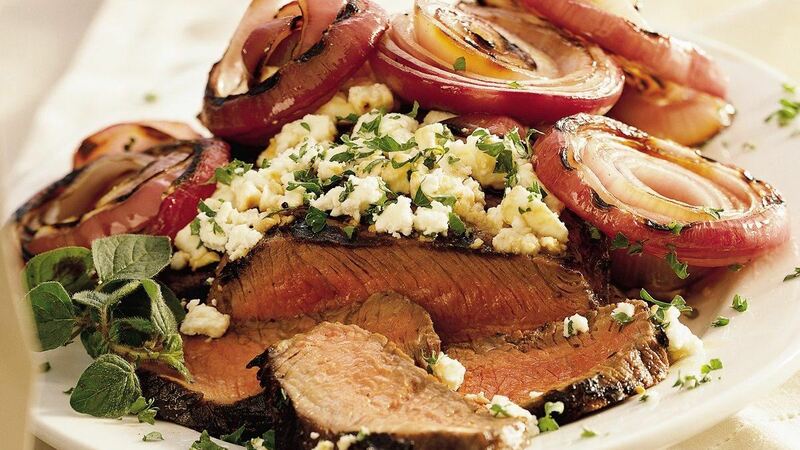 Sprinkle beef with feta and parsley; serve with onion slices. Substitution: For a special occasion, individual beef tenderloins (about 4 oz/250 g each) can be substituted for the boneless beef sirloin. Grill about 10 to 15 minutes for medium doneness. Did You Know: Dry red wines, such as Cabernet, Merlot, Pinot Noir and Zinfandel can be used in this marinade.